More associations choose YourMembership to power their job boards. Our connected platform of job boards, learning management systems and social engagement empowers associations to innovatively match talent with opportunity. YourMembership (YM), a leading cloud-based software provider for associations and member-based organizations worldwide, announced today that it has added more than 100 new career center customer partnerships during the first half of 2016, surpassing 2,300 total career center customers and partners. In addition, the company announced several new partnerships with large associations that include the American Psychological Association (APA), American Academy of PAs (AAPA), the American Bar Association (ABA), and the Journal of Urgent Care Medicine (JUCM), all of whom partnered with YM to become the recognized industry leader at connecting talent with employers in the niche industries they serve. By 2020, the creation of approximately 164 million new jobs is expected throughout the United States (“Recovery: Job Growth and Education Requirements Through 2020,” Georgetown University). Education and healthcare, as well as professional and business services, show the most growth, with more than 80% of its workers requiring postsecondary training (same GU study). Through its ecosystem of products, YourMembership is able to distribute jobs across its integrated platforms, such as online learning environments and association community forums, in a way that is contextually relevant to users, and give employers access to passive job seekers not reachable through other recruitment channels. YourMembership utilizes innovative technology, as well as programmatic advertising capabilities, to maximize qualified candidates for employers who pay associations to expose jobs to their members and niche professionals. YourMembership has the world’s largest recruitment advertising sales force to secure paid job content and non-dues revenue for associations. 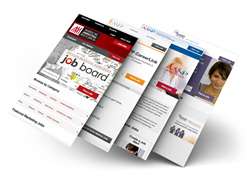 YourMembership’s job board software and platform is mobile responsive, search engine optimized and integrated with social media channels, such as Facebook, Twitter and Association Management Software communities, while offering employers ways to target recruiting of desired audiences, such as diverse or veteran candidates. For more information about YourMembership and its career center solutions, visit us at YourMembership.com/career-centers. Established in 1998, YourMembership helps associations, organizations, nonprofits and other companies worldwide provide more value to their users, drive non-dues revenue through innovative career centers and buyers guides, increase their relevance using ground-breaking engagement tools, and enhance overall operational efficiencies. YourMembership's cloud-based membership management solution enables associations to effectively brand their organizations, engage their customer bases, and streamline their administrative processes. As the world’s largest provider of membership and company management software, YourMembership provides comprehensive membership solutions to more than 4,300 customers in 32 countries. For more information, visit YourMembership.com. To learn more now, call 1-727-827-0046. To get the latest industry updates, read our blog at http://www.yourmembership.com/blog/. Get social with YM on Facebook at facebook.com/yourmembership/, Twitter at twitter.com/yourmembership, Google+ at plus.google.com/u/0/+Yourmembership/posts and LinkedIn at linkedin.com/company/yourmembership-com.